Thursday, Mar 14, 2019 12 p.m. - 5 p.m.
At their foundation blue/green corridors connect open space, creating places for people to play, wildlife to travel, and land to absorb and filter rainwater. 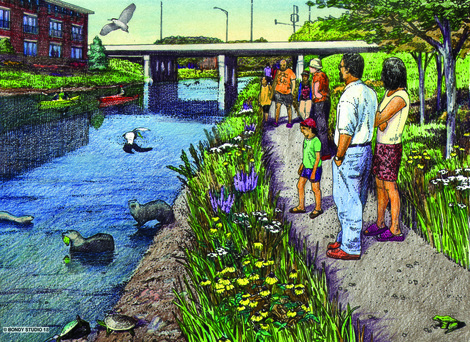 The positive impacts also include social benefits, economic benefits, and a multitude of environmental ones by creating wildlife habitat, reducing combined sewer overflows, and linking important ecosystems. In the face of climate change and the pressure from urban development, it is critical that blue/green corridors are established, enhanced, and protected to benefit people, plants, animals, water, and our quality of life. With 168 miles of existing trail near the river-edge, over 32,000 acres of publicly owned open space within a half mile of the water, and the growing realization that the Chicago River system is of value to us all, opportunities for a healthy and accessible blue/green corridor abound. Please contact Andy Donakowski, policy and planning specialist, at (312) 939-0490, ext. 15, or adonakowski@chicagoriver.org for more information. Tickets are available here. Registration begins at 11:30 a.m.